We slaughter animals–for food, for fashion. Below is a story running today in Indonesia. 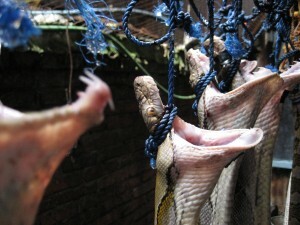 I had a chance to spend time inside an Indonesian reptile slaughterhouse, a major source for US and European skins. It wasn’t pretty. Some of the videos are on my site. One of the photos ran alongside my latest National Geographic story. A dozen of animal right activists staged Wednesday a rally on Jl. Sudirman, Central Jakarta, campaigning for an end to exotic animal skin trade for fashion products. Old school snake hunters call looking for snakes, “flipping tin.” Why? On account of that’s what you do. Are you too fat, too old, or your weather too cold to go out and dig through trash for reptiles? Don’t worry, it’s Oscar season. You can go reptile hunting without leaving your sofa. From the advert pages of Vanity Fair and New York Times Magazine to the latest awards ceremony there’s plenty of opportunity to flip a little bling and find a python or two. You’ll see snakeskin shoes and bags, alligator belts, and more. If you’re good, you can even ID the species. So where do these come from? I have vid of a far larger operation in the videos section.